Drawing a comparison with his Test hundred in 2016 in Colombo, Pujara hoped this innings turns out to be series defining. India skipper Virat Kohli on Saturday described Cheteshwar Pujara's 132 not out against England in the first innings of the ongoing fourth Test as the Saurashtra batsman's best innings that deserve to be at the top. "It is by far your best knock that I have seen, I thought Colombo was your top knock but this has to be at the top of the table," said Kohli during an interview with Pujara in BCCI.TV. "Colombo was challenging but the situation here was even more challenging and the series which is quite balanced now, with that innings we are at commanding position and if we can bowl well today, we can get them out cheaply and win the Test match, so it could be a series-defining knock," he said. Pujara added 32 runs with Ishant Sharma (14) and shared 46 runs with Jasprit Bumrah (6) to take India to 273 in the first innings. Kohli praised the tail-enders, who showed determination to help India take a slender lead of 27 runs. "When we were batting we thought we can take 100 plus lead easily but then the team collapsed and then you showed great determination and the tailenders were outstanding," he said. Pujara also singled out the tailenders for praise. "When I was batting with the tailenders, initially I thought I might be 80-85 not out and we will get bowled out. But the way Ishant (Sharma) and (Jasprit) Bumrah batted, I was really pleased," he said. "I don't think we have seen many tailenders do that in the past, so I think we can rely on our tailenders. So it was pleasing to see the determination from the players," he added. Pujara said his innings in the Nottingham Test helped him prepare for the fourth Test. "Last Test did help me, the amount of time that I spent on crease gave me lot of confidence, and the preparation that I was doing, I could trust that and implement again in this Test match," he said. "But when we (Pujara and Kohli) were batting together, I thought we will give a 150-run lead but unfortunately you (Kohli) got out and rest of the batsmen could have batted well but that is something we will do in second innings." Kohli said he won't disappoint in the second innings after being dismissed for 46. 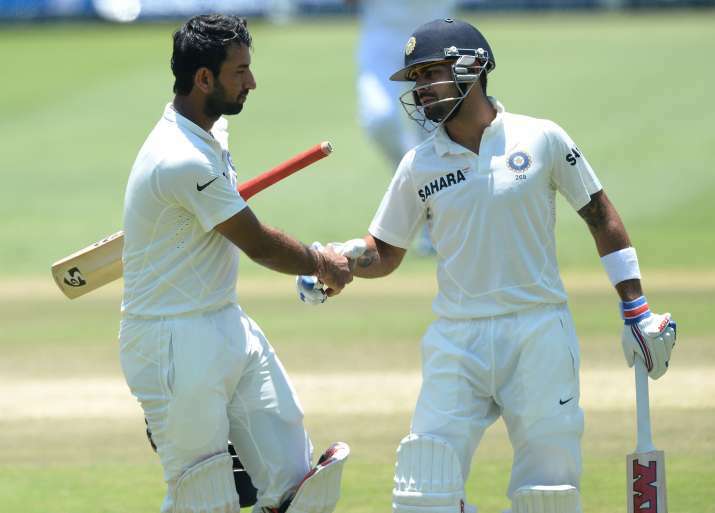 "I won't disappoint you (Pujara) in the second innings, we will make that partnership into a big one," he said.